If you need fast haul off of old furniture give us a call at No More Junk® today. We will help with furniture haul off as well as any other unwanted items that are taking up space in your home. All furniture will live out its usefulness at some point in time, the question becomes what to do with it when this happens. 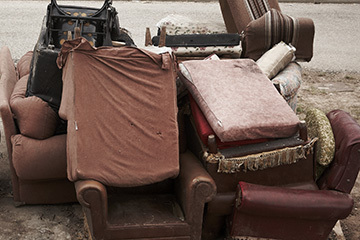 If your furniture is still in fairly good shape when you’re ready to replace it, you may be able to sell it, and when that’s not the case, No More Junk® can help. No matter the condition of your furniture, or the number of pieces it is in, we can help you clear up your home and make room for new items. This service is perfect for people replacing their old worn out sofa with a new one or completely replacing the furniture in their home as well as those who plan on moving soon and have decided to get items to match the new space. Depending on the amount of furniture you have and its condition, you won’t be able to find someone to take it off your hands and can’t just leave it on the curb for the garbage man. No More Junk can quickly show up at your home and take all of the items you want to get rid of, including furniture, old appliances, branches, and any other junk you have. Our haul off services are affordable and convenient as you won’t have to struggle with taking the furniture somewhere to dispose of it or try to break it up into small enough pieces to meet local garbage requirements. This means you don’t have to worry about throwing your back out from trying to lift large items and won’t accidentally damage your walls or other items in your home by bumping into them as you remove the furniture. Our professionals will simply come in, grab the furniture you don’t want, and free up space in your home or business. If you care about the environment, then choosing No More Junk® is perhaps the best decision you can make. We take the opportunity to recycle or reuse whatever items this is an option for, minimizing the amount of garbage that reaches landfills. Whether the worn furniture can be restored or will simply be used for its raw materials, we help minimize the use of natural resources, preserving our planet for the future. We can haul off furniture from anywhere in the North Texas area, including Fort Worth, Dallas, University Park, Westlake, Southlake, Rockwall, Richardson, Plano, Highland Park, Lewisville, McKinney, Farmers Branch, Irving, Garland, Las Colinas, Carrollton, Coppell, Frisco, Allen, and Flowers Mound. Dallas. Fort Worth. South Lake. West Lake. Farmers Branch. Carrollton. Las Colinas. Irving. Garland. Richardson. Plano. Allen. McKinney. Rockwall. Lewisville. Flower Mound. Highland Park. University Park. Coppell. Frisco. Other North Texas cities. © 2019 No More Junk®. All rights reserved.